+ You are nothing but a windbag – “A wise man wouldn’t answer with such empty talk! You are nothing but a windbag. The wise don’t engage in empty chatter. What good are such words? Have you no fear of God, no reverence for him? Your sins are telling your mouth what to say. Your words are based on clever deception. Your own mouth condemns you, not I. Your own lips testify against you. “Were you the first person ever born? Were you born before the hills were made? Were you listening at God’s secret council? Do you have a monopoly on wisdom? What do you know that we don’t? What do you understand that we do not? On our side are aged, gray-haired men much older than your father! + No mortal is pure – “Is God’s comfort too little for you? Is his gentle word not enough? What has taken away your reason? What has weakened your vision, that you turn against God and say all these evil things? Can any mortal be pure? Can anyone born of a woman be just? Look, God does not even trust the angels. Even the heavens are not absolutely pure in his sight. How much less pure is a corrupt and sinful person with a thirst for wickedness! + From my experience – “If you will listen, I will show you. I will answer you from my own experience. And it is confirmed by the reports of wise men who have heard the same thing from their fathers—from those to whom the land was given long before any foreigners arrived. + No escape for the wicked – “The wicked writhe in pain throughout their lives. Years of trouble are stored up for the ruthless. The sound of terror rings in their ears, and even on good days they fear the attack of the destroyer. They dare not go out into the darkness for fear they will be murdered. They wander around, saying, ‘Where can I find bread?’ They know their day of destruction is near. That dark day terrifies them. They live in distress and anguish, like a king preparing for battle. For they shake their fists at God, defying the Almighty. Holding their strong shields, they defiantly charge against him. “These wicked people are heavy and prosperous; their waists bulge with fat. But their cities will be ruined. They will live in abandoned houses that are ready to tumble down. Their riches will not last, and their wealth will not endure. Their possessions will no longer spread across the horizon. “I have heard all this before. What miserable comforters you are! Won’t you ever stop blowing hot air? What makes you keep on talking? I could say the same things if you were in my place. I could spout off criticism and shake my head at you. But if it were me, I would encourage you. I would try to take away your grief. Instead, I suffer if I defend myself, and I suffer no less if I refuse to speak. + God has handed me over to sinners – “O God, you have ground me down and devastated my family. As if to prove I have sinned, you’ve reduced me to skin and bones. My gaunt flesh testifies against me. God hates me and angrily tears me apart. He snaps his teeth at me and pierces me with his eyes. People jeer and laugh at me. They slap my cheek in contempt. A mob gathers against me. God has handed me over to sinners. He has tossed me into the hands of the wicked. + God has shattered me – “I was living quietly until he shattered me. He took me by the neck and broke me in pieces. Then he set me up as his target, and now his archers surround me. His arrows pierce me without mercy. The ground is wet with my blood. Again and again he smashes against me, charging at me like a warrior. I wear burlap to show my grief. My pride lies in the dust. My eyes are red with weeping; dark shadows circle my eyes. Yet I have done no wrong, and my prayer is pure. + I need a mediator – “O earth, do not conceal my blood. Let it cry out on my behalf. Even now my witness is in heaven. My advocate is there on high. My friends scorn me, but I pour out my tears to God. 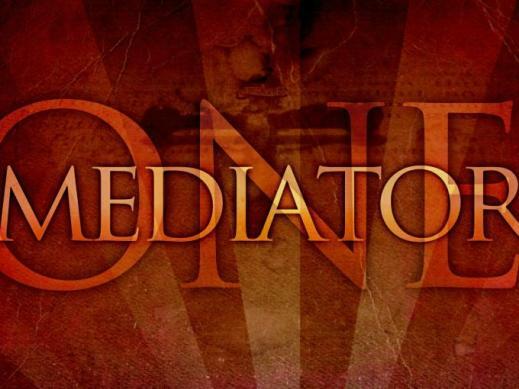 I need someone to mediate between God and me, as a person mediates between friends. For soon I must go down that road from which I will never return.